Faster Times: I would expect DC/Vertigo to be really secretive about one of their superhero properties and less so about a creator-owned title. Scott Snyder: They are being secretive, which I see now is a really good thing. At first, I didnât get why it was so important to tease things out, and I think publicity was a little worried about me as a loose cannon or something, like Iâd give away way too much â and admittedly, they were probably right. So they coached me a bit for the first couple interviews, but now they give me a long leash. I just get excited about talking about whatâs coming, because weâre about 6 months ahead of schedule, and I forget that no one has seen the previous issues yet. FT: The project seems pretty epic. What was its genesis? SS: I came up with it a few years ago in the most mundane way. I was in a hobby shop in the West Village and I was looking at the statuettes and figurines for a present for my friend whoâs a big Dr. Who fan. And there was this statue of an undead Confederate soldier, and I started thinking how Iâm a big vampire fan. And other than certain films like Near Dark, which is my favorite vampire movie of all time, there havenât been things that explored vampires in settings that arenât gloomy, rainy, gargoyle, urban, and nocturnal. The aesthetic of everything, from Underworld, Twilight, Blade, it always has that same greenlit leather-and-velvet thing going on. I thought it would be fun to see vampires with a different character to them, something more animalistic and feral. Not so sophisticated and snobby. Theyâre always in the same kind of settings, speak with that same aristocratic flair. I wanted something more down-and-dirty, more American. 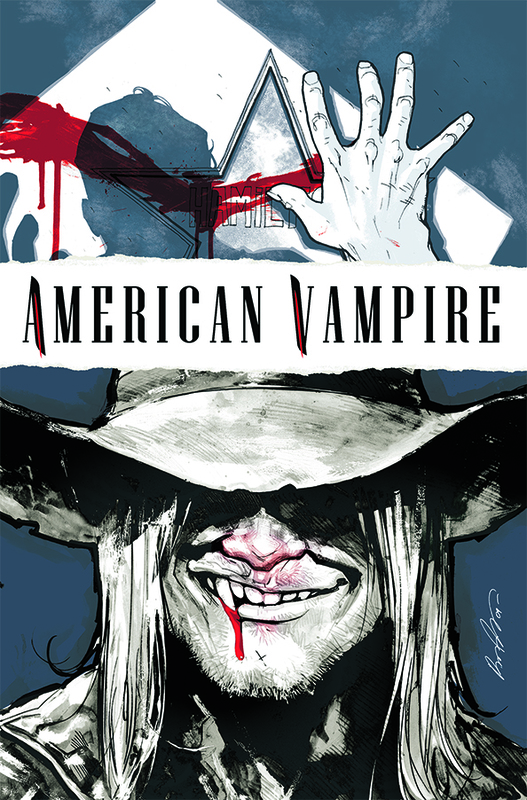 FT: And that led to the core idea driving American Vampire? SS: I started thinking about (vampires) that way and the real idea hit me: instead of having just one vampire type, what if the vampires themselves were a different species or a different breed? From there it exploded in my head to have a genealogical tree of vampires from different time periods and locations around the world. I wanted a secret history where the bloodline, every once in a while, hits someone new. Not just a new population in a new countryâbut something that will randomly mutate and create a new species. I started developing it around this character named Skinner that I thought would be the penultimate vampire. If there was a new species born in this country before the 20th century, where should that bloodline start? Whatâs the best context for exploring both the heroic and monstrous in American culture? And the Old West came to mind. From there, Skinner quickly became the heart and soul of the series. Heâs a vicious, sociopathic, fun characterâkind of the seed of this whole thing. The series itself follows his bloodline and the ways it changes based on the people he turns. For the full interview head over here. I have never liked Underworld, hated Blade movies, and this sounds pretty awful, too, but well, what do you expect when it is co-written by criminally overrated Stephen Dung? I can’t believe you don’t like blades.